We had an idea to create a more modern version of traditional quilt feathers designs. The end result is a stunning new free motion design collection that we titled Fancy Feathers. These designs use a 7-ply stitch, so they are very bold. We used variegated thread, which is a first. Using variegated thread is very difficult, the end result is hard to predict and we are often left with a less desirable result. However, in the Fancy Feather collection the end result is wonderful! There are 20 different stitch designs in this collection and like all of our Mix and Match Collections they come in 4 different sizes. After we came up with the designs we decided to experiment further and combine the designs with different folded fabric backgrounds. 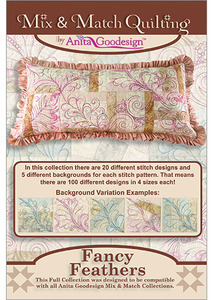 Instead of just a plain fabric background we have included 5 different backgrounds for each stitch pattern. That means there are 100 different designs in 4 sizes each.